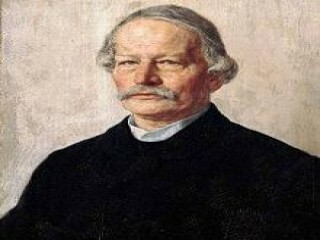 The German novelist, dramatist, and critic Gustav Freytag was perhaps Germany's most popular author from 1850 to 1870. He portrayed the struggles and triumphs of the rising middle class with engaging realism. Born in Kreuzburg, Silesia, on July 13, 1816, Gustav Freytag read voraciously as a boy. At Breslau and Berlin he studied Germanic philology. He abandoned a teaching career after several years to devote his energies to writing and scholarship. Turning first to drama, Freytag demonstrated outstanding talent for technique and theatrical effect and achieved popular success with Die Valentine (1846) and Graf Waldemar (1847), both of which were vehicles for his views on modern problems. In 1848 he moved to Leipzig, where for many years he was assistant editor of the Grenzboten, an influential liberal weekly devoted to literature and politics. His next play, Die Journalisten (1852; The Journalists), still delights audiences with its witty, animated dialogue and admirable characterizations, despite thematic material that is now irrelevant. Freytag's reputation today rests on his narrative works. His first and finest novel, Soll und Haben (1855; Debit and Credit), contrasts the solid and energetic mercantile class with effete nobility and sees the mercantile class as destined to become the foundation for the "new state." His skillful portrait of class types, variety of characters, interest in detail, and humor reveal the influence of Charles Dickens. His second novel, Die verlorene Handschrift (1864; The Lost Manuscript), exhibits a similar concern for detail, this time in the realm of academic life, but is flawed by artificiality of plot and characterization. Drama), Lebenserinnerungen (1886; Reminiscences of My Life), and a series of political essays (1887). In 1879 Freytag moved to Wiesbaden, where he lived in comfortable retirement, showered with honors, until his death on April 30, 1895. View the full website biography of Gustav Freytag.